Smooth muscle: Smooth or Involuntary muscle carries out the unconscious routine tasks of the body such as moving food down the digestive system, keeping the eyes in focus and adjusting the diameter of blood vessels. The individual cells are spindle-shaped, being fatter in the middle and tapering off towards the ends with a nucleus in the center of the cell. They are usually found in sheets and are stimulated by the non-conscious or autonomic nervous system as well as by hormones (see Chapter 3). Cardiac muscle: Cardiac muscle is only found in the wall of the heart. It is composed of branching fibers that form a three-dimensional network. When examined under the microscope, a central nucleus and faint stripes or striations can be seen in the cells. Cardiac muscle cells contract spontaneously and rhythmically without outside stimulation, but the sinoatrial node (natural pacemaker) coordinates the heart beat. Nerves and hormones modify this rhythm (see Chapter 3). Skeletal muscle: Skeletal muscle is the muscle that is attached to and moves the skeleton, and is under voluntary control. It is composed of elongated cells or fibers lying parallel to each other. Each cell is unusual in that it has several nuclei and when examined under the microscope appears striped or striated. This appearance gives the muscle its names of striped or striated muscle. Each cell of striated muscle contains hundreds, or even thousands, of microscopic fibers each one with its own striped appearance. The stripes are formed by two different sorts of protein that slide over each other making the cell contract (see diagram 7.1). What we refer to as a muscle is made up of groups of muscle fibers surrounded by connective tissue. The connective tissue sheaths join together at the ends of the muscle to form tough white bands of fiber called tendons. These attach the muscles to the bones. 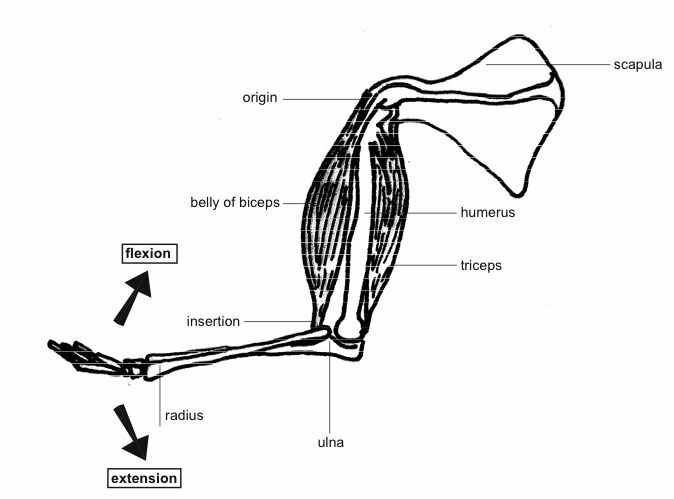 Tendons are similar in structure to the ligaments that attach bones together across a joint (see diagrams 7.2a and b).